The trade mission of the Government of the Balearic Islands and the Chamber of Commerce of Majorca to Malta concluded successfully last 31st May, after an agreement: a visit from the business representation of Spanish islands to the country next months. 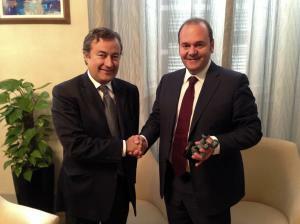 An island delegation, led by the regional general manager of Institutional and External Relations, César Pacheco; the president of INSULEUR and the Chamber of Commerce of Majorca, Joan Gual de Torrella, and its general secretary, Antoni Grimalt, traveled to Malta on 30th May, with the aim of fostering institutional and commercial relations between both island territories. As part of this visit, the entity cameral built bridges between the industrialists and the Islands, in sectors such as energy efficiency, renewable energy, water management and tourism, among others, while shared experiences and knowledge on energy, marine, tourism and air communications. The Balearic representatives joined forces with the Maltese, for the recognition of the insularity disadvantagesin the European Union. In this regard, they agreed to work on a future common brand product from European islands. For two days, the representation of the Government and the Chamber of Commerce held several meetings with the Minister of Economy, Investment and Small Business, Chris Cardona; the Minister of Social Dialogue, Consumer Affairs and Civil Liberties, Helena Dalli, and the State Minister for Gozo island, Anton Refalo. They also met the president of the Chamber of Commerce, Enterprise and Industry of Malta, David G. Curmi, and President of the Hotels and Restaurants Association of Malta, Tony Zahra. There were also visits to Gozo Chamber of Commerce, INSULEUR member. The delegation also met with Spanish Ambassador in Malta, Felipe de la Morena, in order to know his views on the situation in the country, and the president of the Malta Film Commission, Peter Busuttil, to study the Maltese audiovisual model as international film location. This trade mission, which will be filled with a Maltese delegation visit to the Spanish Islands coming months, as happened last 20th May with South Aegean regional government, was coordinated by the Economic and Social Development Council of Malta.